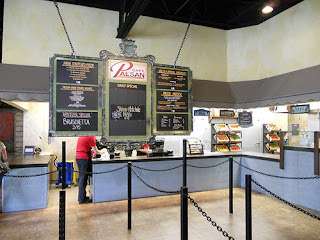 Saturday I had the yummy pleasure of taking a friend out to lunch and since I was in Orem I suggested the new Cafe Paesan: Italian Bistro. I'd heard that it was started by one of the original creators of Cafe Rio Mexican restaraunt...which is one of my favorites!! I love that it's like fast food, but not and it's yummy food! So the whole idea of a place like Cafe Rio but ITALIAN...was a must see for me. Their menu states, "There is an old saying, 'An Italian Grandmother is a gift from God.' The time honored Traditions of Italian Grandmothers preparing family meals each day are the heart and soul of Cafe Paesan (Pie-saan)." They have only one location so far, but hope to open more near Salt Lake. 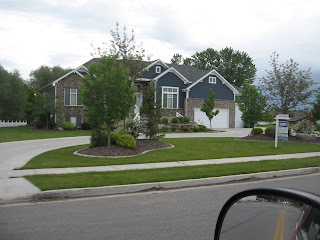 The Orem location is at: 69 South State St., Orem, Utah (801)404-5555. Their take out menu were a four page hand-written 4 page flyer...hopefully they'll get something more professional or a website to reference, but for now I'll try to give you as much info as I can. 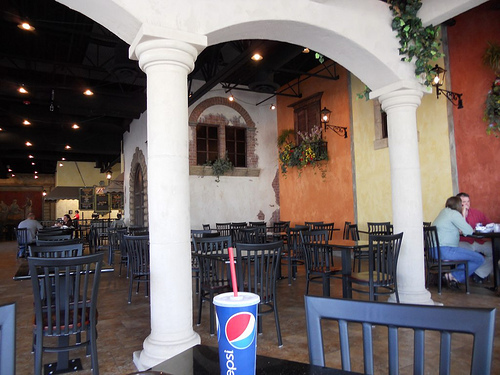 The set-up when you order is just like Cafe Rio, just italian. However, much like my first time to Cafe Rio I was CLUELESS on what to order. And after going there once, I for sure need to go back a few more times to figure out exactly what I would love! My friend ordered from the Pasta Fresca menu. The pasta dish will cost you $7.95 and it's enough I think for two people. 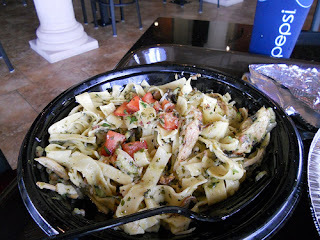 They created her dish fresh (homemade noodles too) and offered her grilled mushrooms and zucchini on top. It was beautiful when they served it (photo below was after a few bites). She selected the chicken with pesto sauce I believe. First you select your meat, either Paesan Italian Sausage, Balsamic Grilled Chicken, Italian Braised Beef or Bolognese Meat Sauce. Second you choose a sauce: Pomodoro Fresh Tomato Sauce, Creamy Parmesan Rich Cheese Sauce, Pesto Creamy Basic & Garlic Sauce, Rosa Sauce Creamy Tomato Sauce or Primavera Grilled Veggies. I ordered the pizza special and oh how YUMMY!! It was an Artichoke/Shrimp Pizza and seriously it was delightful. I loved the sun dried tomatoes mixed with the artichoke and shrimp...it was the prefect size too and made to order and the best crust. They offer six regular menu choices of pizza, but today I picked their daily special (Artichoke & Shrimp). Here's the daily choices, 1) Torrino Apple Braised Pork, 2) Italian Style Braised Beef, 3) Romagna Sausage, 4) Paesan Pepperoni, 5) Siena Spicey Chicken and 6) Margarita. The pizzas are $4.95 and about the size of a plate...made fresh to order as well...yummm! We also ordered the Bruschetta (ate that super fast) and I had a side salad with my pizza special (salad shown). Grilled Flatbread Sandwiches where you pick between Tuscan and Roma Style. You also pick the sauce and meat or veggies for the sandwish. I'm sure those or delicious too! 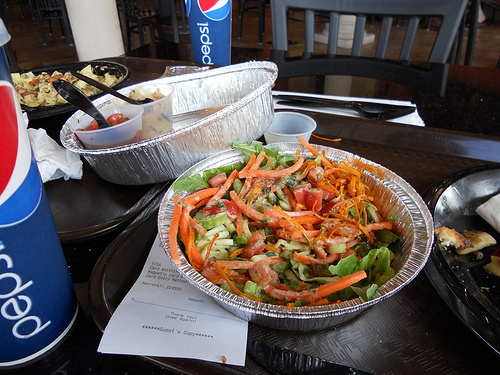 Any a Cafe Rio style restaurant wouldn't be the same without Paesan Hand Tossed SALAD options too! Crisp green and garden vegetables served on freshly grilled paesan flatbread. First choose your dressing: Balsamic Viniagrette, Spicey Honey Mustard (which I tried) or Creamy Pesto. Then next you choose from the following: Balsamic Grilled Chicken, Spicey Apple Braised Pork, Italian Braised Beef or Grilled Vegetables. The salads cost $7.95...can't wait to try one of these!